Hostelworld guests have had consistently high praise for the staff of Giovanni's Home, saying 'Giovanni goes so far above and beyond to make your stay wonderful' and that 'he makes you feel like you are seeing the "real" Italy and not just tourist sights. He knows every guest by name, and really makes you feel like you're at home'. This hostel is located just five minutes from two metro stations and is within easy walking distance of the main sights of the historic centre of Naples. Friendly, English speaking international staff provide tourist information for all the sights you must not miss around town. Enjoy comfortable beds, air conditioning, kitchen, huge terrace overlooking the city - and if you're lucky, Giovanni may cook up a delicious Italian meal during your stay! Had a wonderful stay at Giovannis home, he gave us so much useful information about the city and made some yummy meals which were great!! Giovanni is a great host and will go above and beyond to make your stay hassle free. Great, Giovanni was an excellent host. He even made us pizza one night! My experience at Giovanni’s Hostel was absolutely incredible. From the moment I walked in, he welcomed me and cooked for me (if he offers to cook for you take it). Giovanni tells you exactly what an Italian would do in Naples and even gives you a history lesson. He cares for every person that walks through that door and treats everyone like family. He is the kindest and most caring man I’ve ever met. This was the best hostel I could have chosen and the best one I’ve ever stayed in. Giovanni’s house is the most perfect place to stay, centrally located, and warm and welcoming. Giovanni runs this hostel himself and you can tell he pours his heart into every guest. He provides a map with all of the best places to visit, recommendations whenever you ask, and often cooks (if he makes pizza, don’t pass it up.. it’s the best in the world!) Giovanni made me feel like a local in a new city, and welcomed me in as family. Hands down the best hostel, and I cannot wait to return! Giovanni's home was by far the best hostel experience I've ever had! He was incredibly kind, cooked dinner for us, and took the time to explain the history of Naples. He also gave us a map which highlighted the most important places to visit throughout the city. I will certainly be staying here again when I return to Napoli. Honestly one of the best hostels I have ever stayed at. Giovanni is so caring. Once you arrive he recommends the best places in Naples to go and takes the time to write it all down on a map. He makes the best pizza and pasta! It does not have any lockers but it is still worth booking. The amenities are summed up in the name: you are in Giovanni’s home. Nothing fancy, but great if you want to feel at home (Giovanni’s free, homemade pizza helps). Never have I met a person more passionate for their city then Giovanni is for Napoli; he will give you every recommendation you could ask for, because he wants to share his city with you. Woe be unto you if you do not heed his amazing advice. Napoli is a great city, and Giovanni’s home is in its heart. When we came in by car (not recommended) and head trouble finding parking, we reached out to Giovanni and he immediately took charge of the situation. He made phone calls, spoke to parking attendants on our behalf, and made sure everything went smoothly for us to reach the hostel. The next morning, he sat us down for nearly an hour and drew out a map of the best path to take through the city. We followed his advice to the letter, and we had an absolutely incredible experience in Naples. Giovanni is amazing! Gave us a whole run through of the city, cooked for us constantly. I really enjoyed my stay, and feel like I got to know the city because of Giovanni. Can't speak highly enough of this place. Terrific hostel. Giovanni was/is a wonderful resource full of information about the city of Naples. 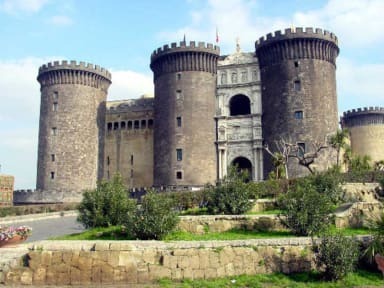 I had come here planning on using Naples as a jumping off point for other places in the area, but with Giovanni's guidance I ended up seeing so many of the charming and historic sites of Naples itself. Still went on my side trips (and Giovanni gave me a wonderful itinerary for visiting these amazing ruins at Paestum then the Amalfi coast) but really was able to appreciate the city we were in too. Hostelworld guests have had consistently high praise for the staff of Giovanni's Home, saying 'Giovanni goes so far above and beyond to make your stay wonderful' and that 'he makes you feel like you are seeing the \"real\" Italy and not just tourist sights. He knows every guest by name, and really makes you feel like you\'re at home'. This hostel is located just five minutes from two metro stations and is within easy walking distance of the main sights of the historic centre of Naples.